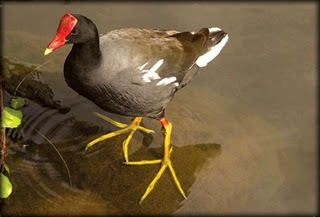 Facts: The Marianas Common Moorhen may look like a duck, but unlike ducks, this bird does not have webbed feet. It has yellow feet, and a red shield that goes from its beak to between its eyes. They are primarily black in color, with a white line of feathers on its wings and can grow to be around 14 inches in length. These birds can be found in freshwater and natural wetlands. Their nests can be found all throughout the year, with each nest carrying up to six eggs. It was once believed that the Moorhen was once a common bird to see around the islands, but with wetland loss and predators like the brown tree snake being introduced; its population has declined a lot over the past three decades.